The Toronto Fashion Incubator has had an illustrious history in helping Canadian fashion designers develop both their creative talent and business savvy. At TFI’s 15th Anniversary event during Toronto Fashion Week, Minimidimaxi caught up with Susan Langdon, TFI director for the past 9 years. Langdon elaborates on the organization’s relationship with the nation’s future stylemakers. One might say it’s the practical version of a master’s degree. The list of TFI alumni is impressive. The likes of Mercy, David Dixon, Ula Zukowska, Crystal Siemens and Misura have passed through these hallowed halls. 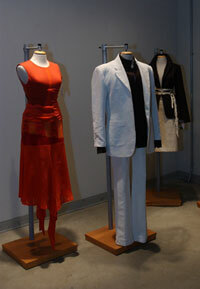 Currently in residence are Harebell by Shelli Oh, Olivera Savic, Arthur MendonÃ§a and others, including Wolves, who showcased their spring/summer 2003 collection in Toronto.